There’s nothing like spending a week in your mother’s home to bring out your inner child, right? Or in my case, I’m spending a hot August week back home getting reacquainted with my angry, scared inner teenager. Last week my 42 year-old self had been teaching to Denver yoga students about our primal responses to fear and trauma. This week in Southern Oregon, though, somehow it feels like 1987 again and my reactive 12-year old self is showing up with those same old habitual responses to fear and challenge: to flee, freeze, or fight. Fight and flight are the well-known responses of the sympathetic nervous system. My go-to reaction has always been “flight,” which is a response to danger that shows up as panic, fear, and anxiety. As a teen I would so often turn and storm off when triggered. Eventually my mom got savvy to my habitual reactions and would only attempt to discuss something when I was stuck in the passenger seat of a moving car and could not physically flee. As a confused teenager without the support and skills that I now have, I also did my fair share of the fight response. Fight shows up as rage, anger and frustration when faced with threat or danger. 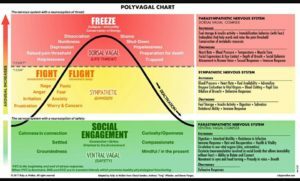 Freeze, on the other hand, is the dorsal vagal response to a life threat, and is expressed in numbness and dissociation. All three of these responses can be very useful when in situations of true danger and threat. I want to be absolutely clear here – by no means am I disparaging our human reaction to trauma. There are times when the threat is real and it is wholly appropriate to flee, fight or freeze. What I frequently see though, and feel in my own body, is that the fear of threat lingers far after the actual threat has disappeared. As busy, high-strung, fast-paced humans of the 21st century, our nervous systems get stuck in the sympathetic mode. We are so quick to freeze, flee or fight in reaction to any small obstacle in our daily life. Meditation and yoga teach us to pause, breath, and evaluate the legitimacy of the fear we feel. Only then can we choose how to act from that place of grounded power and perspective. The simple act of setting up difficult physical situations on the yoga mat can help us navigate fear in a safe space. For me, balancing and inverted poses illuminate this best. Through asana, we learn to approach a scary situation with presence and breath, patience and humor. In my Yin Yoga classes I instruct students to stay in the pose even when it becomes uncomfortable and to resist the urge to fidget or change positions. This doesn’t mean staying in pain and not caring for yourself. It’s just about taking enough time to pause to notice the urge to flee (or fight or freeze) before reacting to the the challenge. Noticing is the first step to a potentially wiser and more appropriate response. I’m in process of recording a class for yogadownload on how the practices of meditation and yoga can help overcome fear reactions. Be on the lookout for it in early November. 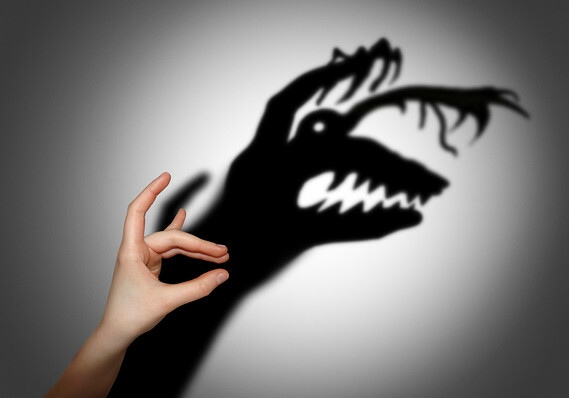 In the meantime, please leave a comment below and let me know about your primal response to fear and threat has been in the past and the present.